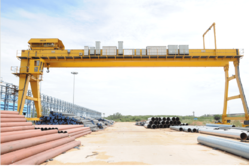 Leading Manufacturer of double girder goliath crane, single girder cranes, single girder overhead crane, industrial crane, single girder underslung cranes and girder crane from Surat. We are a highly reputed organization dealing with providing Double Girder Goliath Crane to our clients. It has excellent quality and is able to function to its peak level for the long time period. This product has a rigid construction and has the high load-bearing capability. Double Girder Goliath Crane is manufactured in accordance with industry standards and is considered to be flexible crane for different applications. It is also considered to be an ideal solution for lifting heavy material in bulk quantities with ease. Loadmate is engaged in manufacture and export of Single Girder Overhead Cranes which is designed as per requisite standards and norms. Our all manufactured products are economical, simple, safe to use and efficient. We are also having to manufacture and modify our products as per demand and requirements of clients. These Single Girder Cranes are widely used in different foundries, chemical industries, steel industries machine shops all across India. Loadmate products are designed to reduce cost, minimum crane structural weight. Single Girder Cranes are designed to cover a wide range of modern industrial demands, providing excellent value for money with no compromise on performance. A Loadmate single girder crane has reduced wheel loads, saving costs on new support structures and increased lifting capacities on existing structures. 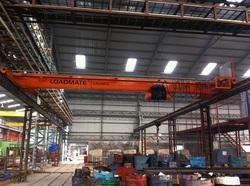 Loadmate offer various crane beam to end carriage constructions to ensure optimum use of headroom available. Hoists are offered as standard in low headroom format running on the bottom flange of the beam. Hoist design ensures maximum cross bridge hook stroke with minimum side clearances. We are a highly reputed organization dealing in providing Single Girder Overhead Crane to our clients. It has excellent quality and is able to function to its peak level for long time period. This product has rigid construction and has high load bearing capability. Single Girder Overhead Crane is manufactured in accordance with industrial standards and is considered to be flexible crane for different applications. It is also considered to be an ideal solution for lifting heavy material in bulk quantities with ease. We specialize in manufacturing a wide range of Double Girder Crane, which are used in the power houses for maintenance purposes. Our engineering experts ensure that these Double Girder Crane have sturdy construction, provide reliable performance and last for years to come. These Double Girder Crane are available with us in capacities up to 125 ton and up to 40 meters. 'Loadmate' Double Girder Crane are manufactured as per industry standards by high grade material. Our products are manufactured under the supervision of our highly qualified team of professionals using premium grade factor inputs. Long Travel Speed: upto 40m/min. Cross-travel Speed: upto 25 m/min. Lifting Speed: upto 12.5 m/min. 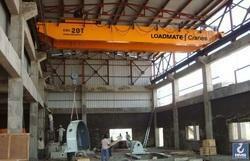 'Loadmate' is the most reliable name in industries as a manufacturer and supplier of Single Girder Underslung Cranes. Our Cranes are widely demanded in various industries for lifting and shifting materials and heavy loads from one place to another. Like all other 'Loadmate' products these Cranes are also designed by highly skilled technicians and manufacture using top grade materials. The range of cranes offered by us is as per the specification of clients, due to which our customers rely on us completely. After careful and genuine research it is found that rates of Single Girder Underslung Cranes offered by us is most economical. We offer wide range of double girder cranes. 'loadmate' girder eot cranes can bear heavy loads and wide spans are required. our range of products is manufactured by our skilled professionals using premium quality components and high-tech technology to assure optimum performance at users’ end. our girder cranes are available in market at reasonable prices to meet the customers’ needs. 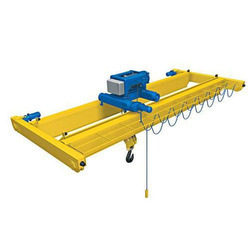 as with all other types of 'loadmate' cranes traveling cranes, the profiles of the main girder are optimally produced using computers so that maximum performance with a minimum of deadweight can be achieved. Being a leading manufacturer and supplier of Manual Cranes, we have achieved a benchmark position in the industry. 'Loadmate' products are manufactured using the best grade components and advanced technology under the guidance of our skilled professionals. Developed in strict accordance with the international quality norms & standards, our range is appreciated for its strength, robust construction, high efficiency and excellent performance. Moreover, we ensure to deliver these products on given time frame in various places all across the world.